This month I'm the host for the special project, the Queen of the afternoon tea (or coffee if you like!). The members of the Chicken Farm Bakers' project held this challenge and welcome everyone to participate (sorry for the people who can't read Thai because I write in Thai language, if you want to read you can see it here). But because I'm the host for this challenge, I can't participate -*- (even I really want to, but it's not fair if I held the challenge and get the prize, haha). 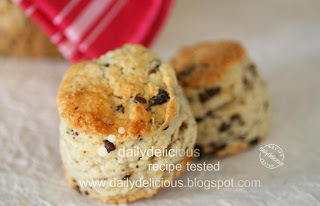 So, I post it in my blog instead, hehe, and for the afternoon tea, I choose Scone. Whenever people talk about having the afternoon tea party, scone is one of the stable, well it's the traditional. 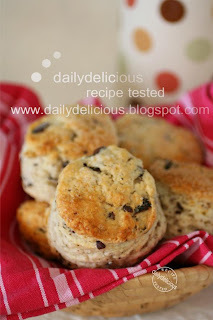 I like to make scone, for many reasons, first it's delicious, second it's easy and third it's quick. So every times that I lack of something to eat (I have to have a bread or something like that in the fridge to feed myself in the lazy afternoon haha), scone always be my first answer. There are many recipes for the scone, some made from butter and milk, but I like the one made from cream because it's easier to make and richer in taste. 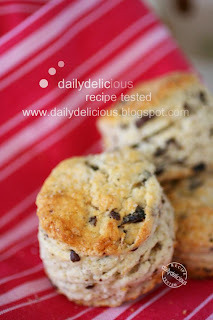 When making the scone from cream, you don't have to worried about the coldness butter and mixing it is a breeze. 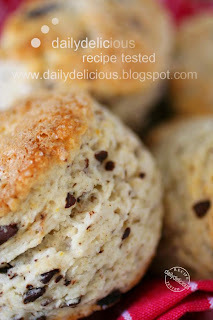 I choose to make chocolate and cranberry scone, the scone that pack with a lot of taste, tang from the cranberry and the sweet and bitterness from the chocolate. So, it's great to eat it plain with a lot of salted butter, ^ ^. 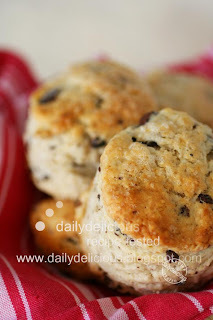 Serve the scone warm then split it half and place a dollop of soft butter, take a bite and sip a tea, well another great time for your relaxation. 1. Line a baking sheet with parchment paper or a nonstick silicone baking mat; set aside. 2. In a large bowl, whisk together the flour, baking powder, granulated sugar, salt, and zest. Stir in the cranberry and chocolate chunks. 3. 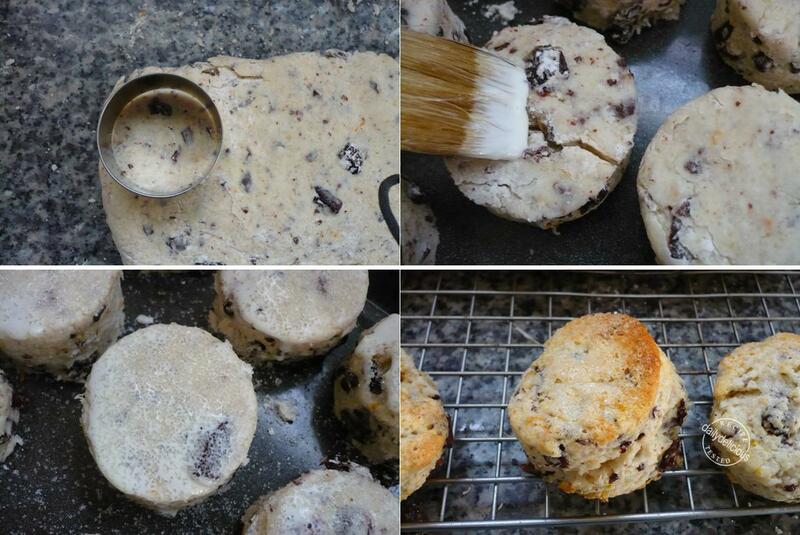 Add 1¼ cups off the cream and fold with a rubber scraper or your hands until the cream has been completely absorbed. Then continue adding cream by the tablespoon just until the dough comes together and there are no dry patches. 4. Turn the dough out onto a lightly floured work surface. With lightly floured hands, gently press and pat out the dough into a 1-inch·thick square. 5. Using a 2-inch round cookie cutter, cut out as many rounds as possible, dipping the cutter into flour after each cut. Reroll the scraps and continue to cut out the dough. Place the cut scones about 2 inches apart on the prepared baking sheet. Refrigerate the scones until firm, about I hour. 6. Lightly brush the top of scones with the remaining ¼cup cream and sprinkle generously with the sanding sugar. Bake, rotating the baking sheet halfway through, until the tops are golden, 25 to 30 minutes. Use a metal spatula to transfer to a wire rack to cool. Hi! Would like to know if i can use thickened cream or heavy cream instead of whipping cream? Pain au lait: Delicious mini milk bread!